And now one more year is done. Our grandchildren all had a wonderful Christmas. They got along...for the most part. Austin had a Star Wars year...everything he got was Star Wars which is what he's totally addicted to right now. Jaiden is the dress-up girl. She got a baby doll to dress up and 3 Disney Princess outfits and 3 work costumes so she can be a chef, a construction worker and a hair stylists (which is what she wants to be when she grows up. And Aaron was so funny this year. He's 2 1/2 and is smart as a whip though a little behind in vocalizing. 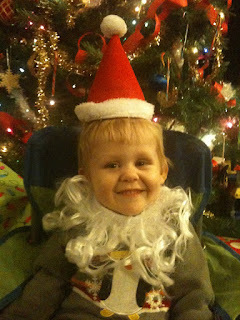 This photo is of him wearing the dog's santa hat and beard.